Week 5 2013: Results are in! Week 5 was a big week with tons of picks from lots of experts. I guess that happens when there’s significant games going on. The biggest stumbling block this week from our experts was the Oklahoma St/WVU game. Nobody that picked that game got it right. Due to that fact, our winner this week is Gameday celebrity picker Bubba Watson, who went undefeated at 10-0 (but didn’t pick the OKSt/WVU game). Jennifer came in at an impressive 13-1, and will share this week’s victory with Bubba Watson. Other winners include Colin Cowherd (9-2), Charlie Arbuckle (8-2), and Dari Nowkhah (8-2). Losers this week are Desmond Howard (3-4), and Brian Griese (2-3). 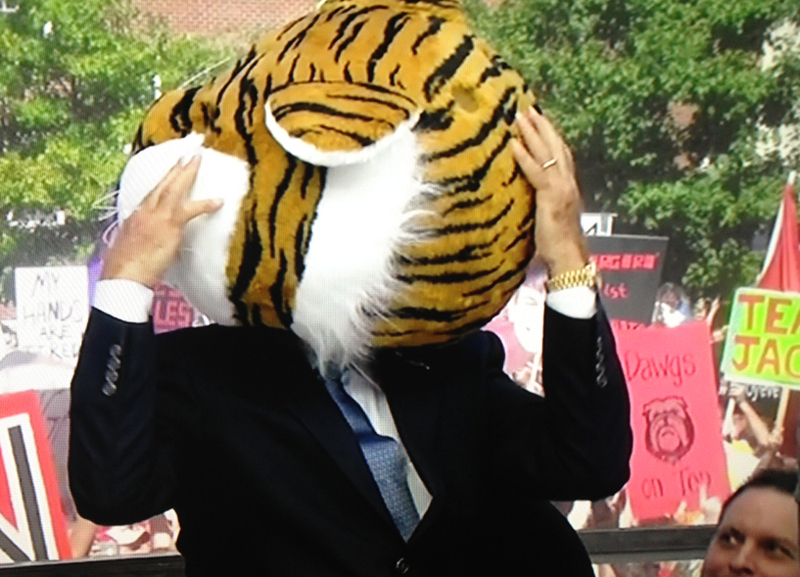 Corso lost his headgear pick going with LSU. 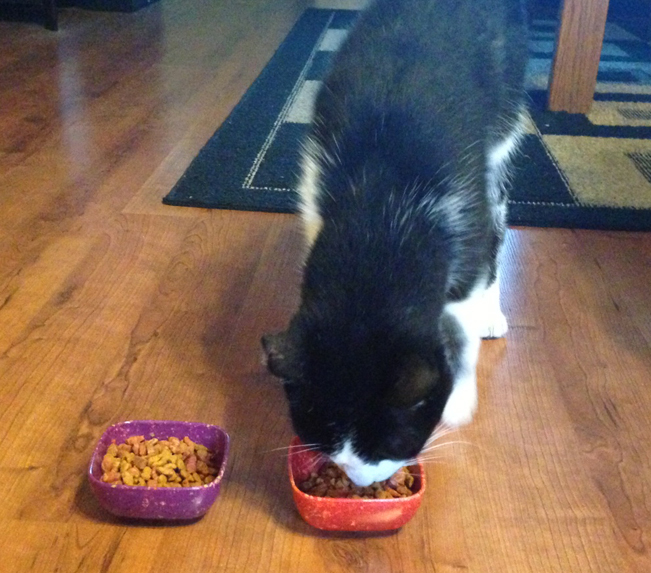 Billy the Cat won by picking Georgia. They are both tied at 2-3 on the year, so its a good race to see who can pick big games better. Commemorative fruit baskets have been mailed to this week’s winners along with their certificates. Check out below to see how your favorite (or most hated) personality did this week. Week 5 2013: College Gameday review! Well here we are again folks. Another edition of College Gameday is in the books. Today’s edition was broadcasting live from Athens, Ga for the matchup between #6 LSU and #9 Georgia. Last week’s edition was going to be hard to top after visiting Fargo, ND but Athens has a reputation as one of the rowdiest of locations for Gameday. It was made clear up front that Georgia does not have good luck with Gameday is in town: they are 3-12 all time with Gameday on-site. Could they turn this thing around put up a win? I guess we will find out. For starters, the crowd was incredibly loud today. They bring serious entusiasm in the SEC when Gameday is in town (possibly enthusiasm brought in bottles). Early on, there were some technical difficulties. I don’t know how to describe it other than it sounded like David Pollack’s mic was being broadcast from the moon, streaming via broadcast.com in 1998 on dialup. 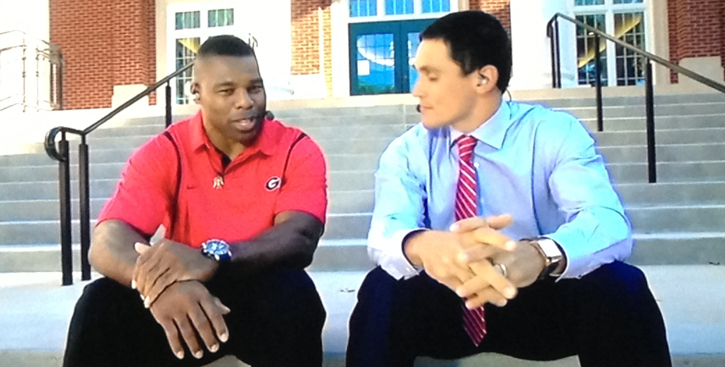 Anyways, after we got that sorted out college football hall of famer Herschel Walker joined David Pollack on the stairs outside of a building for an interview. Hopefully this is going to be a new regular feature entitled “OVERLY CASUAL FOOTBALL INTERVIEWS WITH DAVID POLLACK!!! !” Pollack removed his suit jacket and they sat down to very casually discuss Georgia football. We were then treated to another segment of “QB Guru George Whitfield Talking About QBs”. You couldn’t hear him over the rowdy crowd for the first half of this segment. In the second half he talked about Aaron Murray’s mechanics. Pretty impressive stuff that we haven’t heard for four weeks prior to this. At all. There was a distinct lack of Samantha Ponder for the first hour or so of today’s show. When she finally showed up, we weren’t sure exactly what she was wearing or why she was wearing it. It appeared to be a nice pair of riding pants sans boots, which looked very strange. Jennifer questioned the choice of these pants, the shoes, and said the jacket made her look boxy. You can be the judge. Sam Ponder: What am I wearing? Speaking of Sam Ponder, she interviewed Georgia coach Mark Richt. The biggest takeaway of this interview was that Richt’s wife is one of the water girls on the team. Today’s piece from Gene W. was about Ole Miss coach Hugh Freeze. Apparently he was portrayed as a complete goober in the movie Blind Side, and he even auditioned for his own part but failed because he couldn’t get his one line right. The funniest part of this was when he told us that if things aren’t working at halftime he likes making changes, including making his offensive coordinator change clothes completely at halftime to turn around the mojo. Perhaps the high point of today’s show was Tom Rinaldi’s piece about Gameday signs. Apparently the first Gameday sign was on location back in 1994, and nobody knows who the guy was or what his sign said because it was blurry. Since then, things have exploded and as you know, signs are everywhere. This was a really cool segment about the history of Gameday, and I wish they would do more history segments about Gameday. The best part was afterwards when Rinaldi showed up wearing jorts, in reference to a recent sign about Jeff Driskel going for it on “4th and jort”. Classic. Speaking of Gameday signs, today was a pretty poor effort by the Georgia crowd. 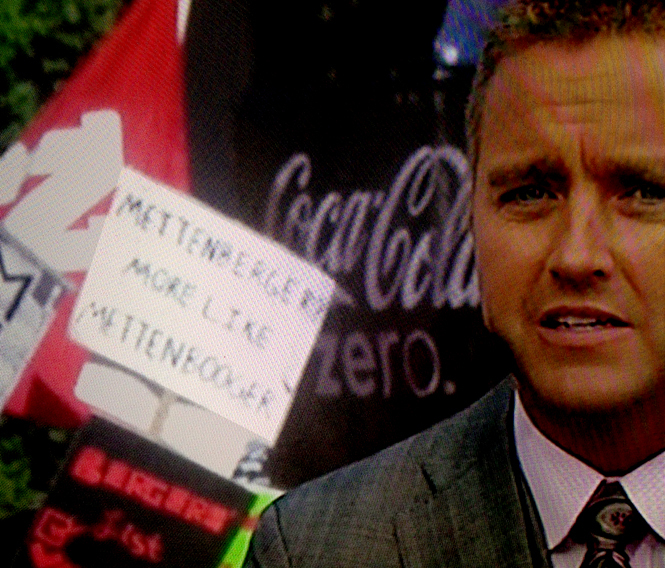 I don’t know if they lack the writing skills or what, but today’s sign could barely be made out, and it reads “Mettenberger? More like Mettenbooger”. Come on Georgia, you can do better. A few more highlights from today’s show include Paul Finebaum declaring that Lane Kiffin is the Miley Cyrus of college football: no talent, but we can’t stop watching. He said “maybe next year they will hire an adult to coach the team”, echoing my sentiment that Lane Kiffin has accomplished absolutely nothing in his career, yet continues to get promoted to better and better jobs. Also, Paul Finebaum loves the SEC and wants you to get off his lawn. We also had a historical moment today. Chris Fowler’s hundred dollar question was FINALLY won. I hope you remember where you were, so you can tell your children about the time that Kirk Herbstreit won the Chris Fowler hundred dollar bill. Today’s question? What college has the most NFL starting QBs today? Of course the answer is NC State. Russell Wilson, Mike Glennon, and Phillip Rivers. Well done Herbie. But let’s get down to the business at hand, which is the picks. Today’s guest celebrities (yes multiple) were Willie Robertson (from Duck Dynasty) and Bubba Watson (from golf). They were a fun group today, with lots of jawing back and forth. Robertson seemed to know very little about football for someone so southern and with such a questionable beard. Watson seemed pretty knowledgeable. Billy the Cat went with Georgia over LSU, bringing his record to 2-3 for the year. Would Corso go with Georgia for the second time this year? Or would he go with the visiting team in LSU? His headgear picks were 2-2 going into this week, and he put on the Tiger head, going with LSU. He happened to put it on backwards, which was both hilarious, and foreshadowed the LSU loss. Billy the Cat and Lee Corso are tied at 2-3 on headgear picks this year. Boy, what a race! Enjoy your evening folks. Things are up and running in Athens, Ga today for the big matchup between LSU and Georgia, which means we are up and running live from the comfort of our home. There will be updates all morning starting here with a little Todd McShay, then expect some Dari & Mel, and of course the regular Gameday crew including Corso’s headgear pick. Check back often for updates.